Remember back here when I started the 30 Days Without Accessories Challenge and I showed you my junk room? In case you missed it or have forgotten, here it is. You are warned. Yeah...I still hang my head in embarrassment. But I am pleased to announce that we have been working on it. 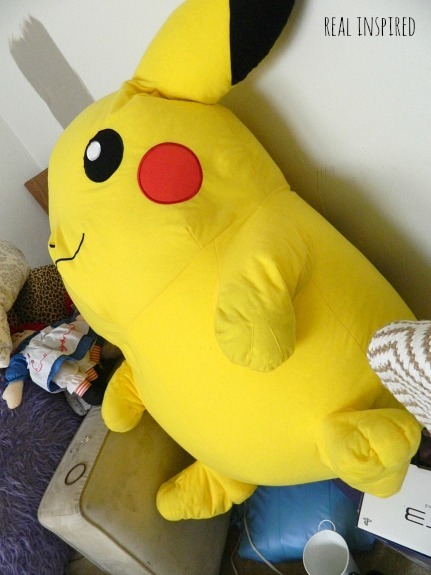 My In-laws came and moved their stuff out, including the chair, skinny bookshelf and random Pokemon. Ahem, anyway, when they moved their stuff out there was quite the room to be had. All that baby stuff found a home in the attic, along with boxes of mine and Hubby's old toys and stuffed animals. Please tell me we're not the only ones still hoarding their old stuffed animals? So now there was only to sort through what was left. Basically everything. Yard sale stuff went into bags and from thence into the shed to await their fate. Some stuff never even got a chance. It went straight into the trash. Progress? Oh my yes! I still get discouraged looking at it at times, but then I remember what it was. 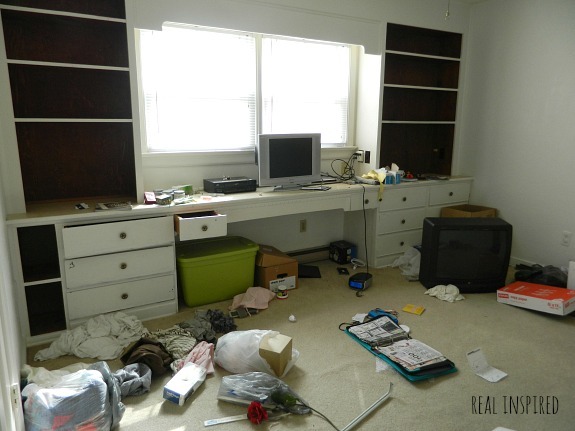 We're practically swimming in cleanliness here in comparison! We took down all the books and stuff to get the room ready to paint. So happy to paint! Goodbye to those dark wooden holes that eat every bit of light that enters! Somebody was enjoying the new space along with the little treasures still laying about! Ain't he adorable? 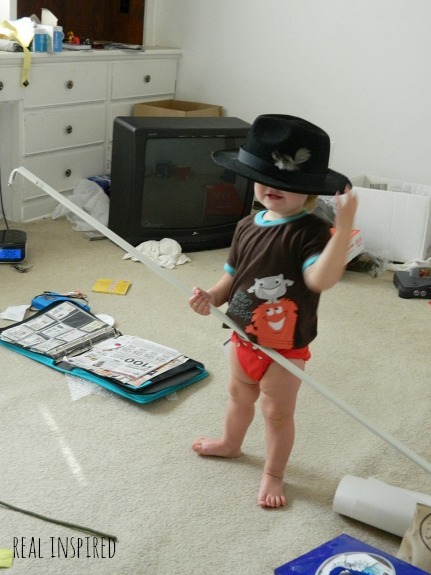 A boy with a fedora, fluffy bum, and a curtain rod weapon? Totally wins in my book! You are totally not the only one collecting old stuffed animals, among other things. Sentiments do sometimes get the best of us, and that makes it hard for people to let go of these stuff. 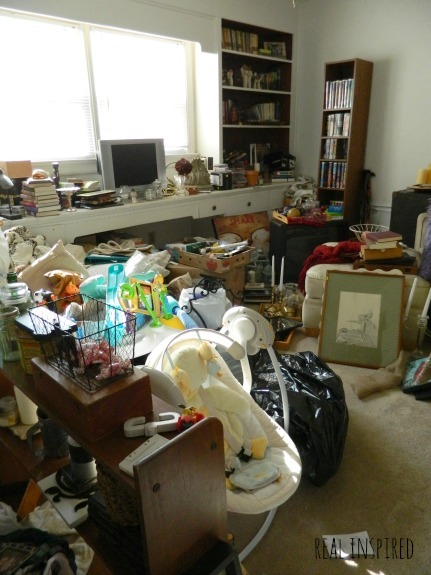 A yard sale was a practical idea to reduce their numbers to a managable degree. 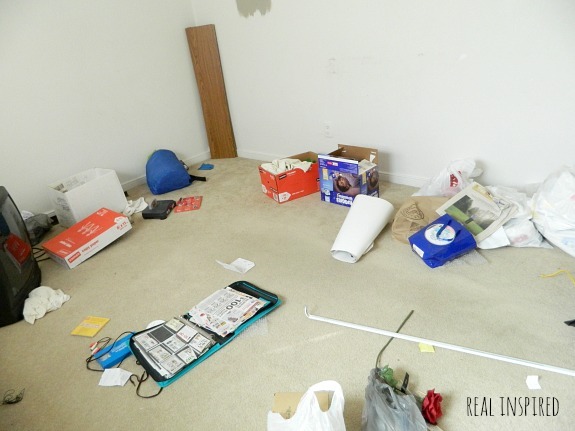 Actually, anything that involves removal of these junk would be considered more practical than letting this space go unused because of the clutter.